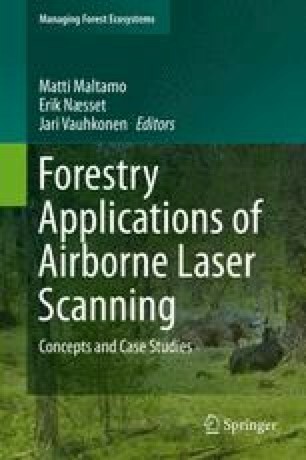 This chapter reviews the use of airborne LiDAR data for the segmentation of forest to tree objects. The benefit obtained by LiDAR data is typically related to the use of the third dimension, i.e. the height data. Forest and stand objects may be segmented based on physical criteria, for example height and density information, while a further delineation to different timber types would require leaf-off data or an additional data source such as spectral images. Most forest applications of the LiDAR data are based on using digital surface models, but especially tree-level segmentation may benefit from a combination of raster and point data, and can be performed solely on point data. Finally, there are several established techniques for tree shape reconstruction based on the segmented point data.